This is a new collaboration between the Iranian Porya Hatami and the Czechoslovakian Artificial Memory Trace aka Slavek Kwi, who resides in Ireland and the one that precedes his previous album „Evolva“ 5. Since 2014 these sound artists have been exchanging field recordings captured in their local areas that later are processed. “Repremonitium” is one track only of around 70 minutes long which displays sinuous sounds that move in the background while the field recordings emerge almost clearly in the surface alongwith voices, bird songs, insects and found sounds, all of it arrange with subtle sounds generated by a design software, creating soundscapes with a rich variety of shades. 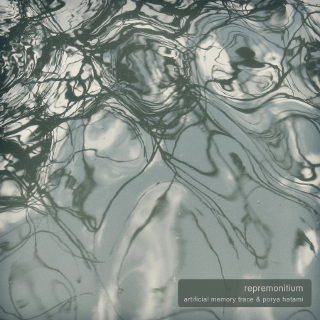 Artificial Memory Trace & Porya Hatami hark back to early electronic music pioneers with the soothing bliss of “Repremonitium”. Quiet and contemplative the piece unfolds in discrete ways. Subtle transitions are of the utmost importance for the music shifts with grace and taste. By incorporating lovely tender analog sounds alongside found sounds and manipulated field recordings, the sound feels alive. Layer upon layer of this work results in miniature movements and symphonies, all of which come together in a blissful serene state. Nearly silent, the sparkling introduction begins the piece on a gentle note. With every sound fully realized the way that the piece unfurls feels gorgeous. Slowly but surely, they zoom out, incorporating a wider spectrum of sounds into the mix. Eventually the outside world is brought into the fray, letting the tactile sound further emphasizing the fragile nature of the piece. Akin to a classical style, the next movement has a nearly nostalgic, yellow-hued tone that drifts off into the infinite. The texture changes once more into something much more industrial as the romantic sheen wears off for a bit. Halfway through the piece everything gains a meditative, Zen-like quality to it. Various details are scrubbed clean resulting in a shimmering drone whose static qualities are calming. For the latter stretch of the piece Artificial Memory Trace & Porya Hatami create a mood like that of Vladimir Ussachevsky’s cherished 50s and 60s works. With “Repremonitium” Artificial Memory Trace & Porya Hatami deliver a spellbinding work, one whose temperament is trance-like in tone.